Street Fighter V (ストリートファイターV, Sutorīto Faitā Faivu?) is a fighting game produced by Capcom, which co-developed the game together with Dimps. It is the fifth main numbered entry in Capcom's Street Fighter franchise. The game was released in February 2016 for the PlayStation 4, Microsoft Windows as well as Linux, and features cross-platform play between the three platforms. 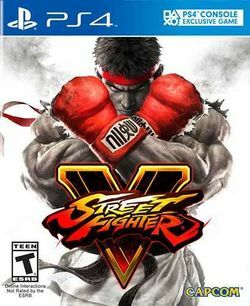 Street Fighter V carries on the side-scrolling fighting gameplay of its predecessors, in which two fighters use a variety of attacks and special abilities to knock out their opponent. The game features the EX gauge introduced in Street Fighter III, which builds as the player lands attacks and can be used to either power up special moves or perform super combos known as Critical Arts, although the Focus Attacks from the previous game have been removed. New to this game is the "V-Gauge", which builds as the player receives attacks and adds three new techniques: V-Skills, V-Reversals, and V-Triggers. V-Skills are special attacks unique to each fighter; for example, Ryu can parry an attack while M. Bison can reflect projectiles, some of which build V-Gauge when successfully performed. V-Reversals allow players to use a section of the V-Gauge to perform a counter move whilst being attacked. Finally, V-Triggers use the entire V-Gauge to allow the player to perform a unique ability, such as a temporary damage boost for Ryu's fireballs or added hits to Chun-Li's attacks. Additionally, the Stun Meter, which has been present since Street Fighter III, is made visible under the health bars in this game. The Stun Meter increases when receiving consecutive attacks and will cause the player to become stunned if filled; thus, it encourages players to play offensively when the opponent's Meter is close to full. The game also features interactive arenas, showcasing special animations when a player is defeated in a certain part of the arena. The game features 16 characters at launch, four of whom are new to the Street Fighter series. Following the game's launch, several additional characters will be developed and added to the game via regular updates, beginning with six characters currently planned to be released throughout 2016. These characters, among other post-launch content, will be able to be purchased via either of two in-game currency systems: "Zenny", purchased via real-world currency, or "Fight Money", earned through gameplay. The new characters include Necalli, an intelligent wild Aztec-like warrior from an unknown country (presumably Mexico) who seeks a strong opponent's soul, Rashid, a Middle Easterner who is capable of manipulating wind and is searching for a missing friend who has been kidnapped by Bison and Shadaloo, Laura Matsuda, a Brazilian fighter and older sister to Street Fighter III veteran Sean Matsuda who uses Brazilian jiu-jitsu and electricity in her attacks, and F.A.N.G., a new member of the Shadaloo Grand Masters who combines long ranged attacks and slippery movements with his ability to poison his opponents. This page was last edited on 8 July 2016, at 02:54.